I am sooo thankful you stick around to hear from me each week and to have the opportunity to share with you anything that can make your entrepreneurial journey a richer experience. 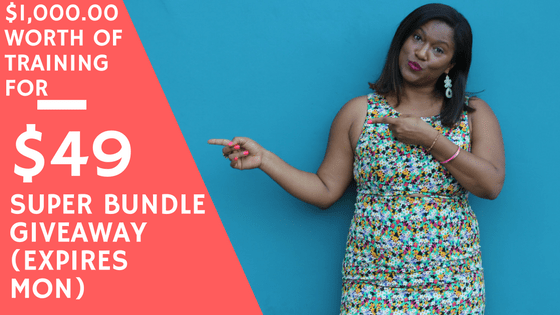 As a thank you, I put together a SUPER bundle valued at $1,000.00 that I’m giving away for only $49.00. This offer expires on Monday at midnight PST so take it while ya can. You’ll get done for you email sequences for launching, Facebook ads training to grow your list, sales funnel tutorials and my personal help so you can implement and make money. The MOST exciting part though is I’m giving away the moneyyyy! All proceeds will go to The Malala Fund to support girls’ secondary education programs, fund global advocacy efforts and help Syrian refugee girls get back to school. So you’re doing a good deed and getting a great deal at the same time. Education is the most powerful tool we can use to change the world and empower the next generation of female leaders. I hope you’ll take me up on this offer. My goal is to raise 1K from my generous community and what an awesome way to do just that. Lots of love and gratitude and gravy! P.S.The recap: Buy my $1,000.00 digital course bundle for $49.00 dollars today and all proceeds are going to support The Malala Fund. Click here to buy now and get instant access to all the trainings listed above.